Welcome Operatives to the Department of Nerdly Affairs, tonight your hosts Rob Paterson and Don Chisholm discuss whether the nerdly spectulators markets of the 80s and 90s helped or hurt nerd culture, and how this crept into the action figure market as well. 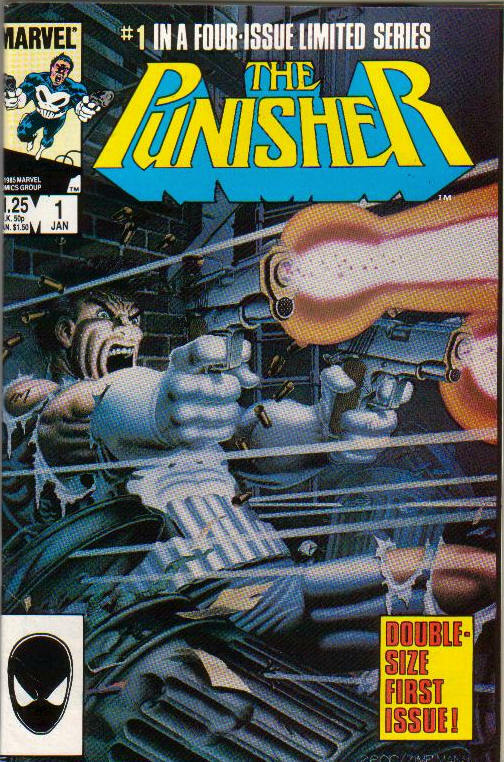 Don gives us the comic shop eye view of the industry during this period, and we talk about how the Punisher was responsible for the comic speculator’s boom of the 1980s. All this and more are waiting for you in Episode Three of The Department of Nerdly Affairs! Come chat with us at obeythedna.com! Now you’re talking about my jam! I love Space 1889, and yes I’ve heard of TORG (if I remember correctly there were adverts for TORG in Dragon Magazine?) I have pretty much everything Space 1889 put out including the miniatures. I’d like to say I bought them all but I actually won a collection of them when I was in the Guelph Comic store for one of their big days. People loved Todd McFarlane’s Spider-man. Heck, Andrew Garfield LOOKS like Peter Parker drawn by Todd McFarlane, and that’s one of the reasons (along with Garfields better quips) why I love the recent reboot of Spider-man more than the Tobey MaGuire incarnation. The problem stems with The Speculator (I capitalize because seriously someone should be making a Marvel villain that name) said, “Everyone is buying these funny books for the art work anyway… let’s give the writing to them.” and thusly began the age of the Artist/Writer comic book and the downfall of readers. Byrne was a Writer/Artist. His stories of Superman were genuinely much better because he scrapped off the thousands layers of over the top super powers of the Man of Steel and brought him back down to Earth. Heck, nearly every fight he had tore up his cape until he got a special one from an alien. Much more interesting. But that was the eighties, and yes, Crisis on Infinite Earths (the first) WASN’T a non-event. It entirely rebooted the whole franchise and made DC Comics cool for the first time since maybe the fifties. They started everybody over. Suddenly Frank Miller’s Dark Knight was the default Batman. Denny O’Neil helped usher that in with the new “Legend of the Dark Knight” book. Barry Allen was dead. Pretty much permanently from an amazing scene in the Crisis series and Wally West (Kid Flash) dropped the ugly yellow suit and took on the mantle of the Scarlet Speedster. Supergirl was gone, and the whole idea of Earth-1 and Earth-2 and all the other Earth dimensions were dumped in the toilet. Streaky the Super cat? Never heard of her. Jake the Bat Dog? What are you talking about Willis? All the sillies of DC was dumped and that’s why the mid-eighties was a glorious time to read comics. Story was king. Back to Todd MacFarlane. So some brilliant people said, “Lets make the artist write” and you can see the horrible decay of story in Web of Spiderman as McFarlane writes even more paper thin plots designed to set up a big fight scene and lots of gossamer webs. So if you were me (remember, story is king guy?) you moved to Malibu comics where the super heroes were really interesting and their interactions were awesome. Or you read Astro City which did the same thing (although I believe that was slightly later). It was the rise of the Artist/Writer that killed comics because the Speculators wanted three of the same issues but different cover art because it was all about the art and not the story, and all of us ran and hid. Not because it was expensive, but because it wasn’t worth buying the story to read anymore. It was only when the Alan Moore’s and the Neil Gaiman’s and the Doug Moenchs and the Chuck Dixon (I love Chuck Dixon’s style and when I find his Airboy comics I pick them up like candy) pushed back to the forefront to remind folks this is what comics are for. Again, I challenge the idea that the average every day modernity equals adult. I get it more knowing that you never liked super hero comics. You have to appreciate that what you’re advocating as mature is really a genre and not a sign of age in one way or another. Dish Man (yes he was a super hero who’s ability was to wash dishes and an indy comic that showed up in black and white pamphlet size in Guelph Comic Store I remember) may be mundane but that doesn’t make him any more adult than “Love and Rockets” were. It was just a different genre. For years science fiction writers had to suffer the slings and arrows of the same critique “Just not for adults”. It was snobbery then and hey, I fully admit to being a book snob (see my post on the problem with libraries today! LOL) but just because you have lots of action and adventure doesn’t necessarily relegates it as “for the kids” anymore than pulp stories and dime novels were for kids alone. Just a genre choice. Finally, as Rob will tell you, I’m that cranky old man I guess who never gets anime. Yes, there’s some I have enjoyed- Steam Boy, Howl’s Moving Castle, Akira.. but for the most part, the stilted dialogue, incomprehensible plots, all plotted in a universe where every male character looks like a shaggy headed boy band singer, and every girl is a prepubescent rainbow-tressed romance obsessed purveyor of the weirdest magical abilities (“Magic Lily Peach Wedding Powers ACTIVATE!”) strikes me as an example of why alien life refuses to let themselves be known on our planet. Even the Japanese Batman comics from the bygone age were a strange brew. Oh… and SPACE 1889 ROCKS! 🙂 I’d be happy to be shown TORG some day! Hee heee…. two games that should have got more love than they did. But I’m hoping to save that for a later show…. I’m not a Byrne fan. I don’t think he’s BAD; but I think he got overhyped back in the 80’s. I think that was part of the problem you’re getting at…. the start, anyhoo of the “Designer Comic.” Meaning a book that’s sold not on it’s merits as a book, but based solely on the names attached to it. Byrne had the chops to provide a decent book; and prior to him Kirby was the big name and he DEFINITELY had the ability to produce good stuff…. but in the age of the Speculator (that being the 90’s) you had the phenomenon expanded so’s that the big names didn’t HAVE to produce. >unless you’re trying to sell me Giffen art and then thanks but no thanks. This is something I’m sure will come up later. If you look at his early stuff…. early 80’s Legion for instance, he doesn’t look that different from anyone else. (He uses a finer line…. oddly enough.) But as things went on…. > “Everyone is buying these funny books for the art work anyway… let’s give the writing to them.” and thusly began the age of the Artist/Writer comic book and the downfall of readers. That’s DEFINITELY right, and it’s the other nail in the coffin. The Big Two realised the names were selling the books, and decided to make said names more prominent. Worked real well…. until the NAMES figured it out, left and started Image. Then the flood gates were opened, companies produced TONS of stuff that was all the same, the readers left and when the Specualtors figured out that the twenty copies of “X-Men #1” they had polybagged were never gonna be worth anything, they left too. >I get it more knowing that you never liked super hero comics. Damage Control is great ‘cos it answers the question of who’s rebuilding New York every week or so. Something that…. for decades…. MUST be happening, since we don’t see large tracts of urban wasteland in the background of every comic. >I’m that cranky old man I guess who never gets anime. So YOU’RE the guy! I always tell folks who don’t like Japanese comics that there’s SO MUCH variety out there that some of it would appeal to you. (As you’ve already noted.) The biggest problem is that folks think of it as “anime” like it’s a weird, homogenous thing. It’s not. That’d be as if I’d never seen tv before, watched an episode of anything with the word “Housewives” in the title, and from that decided that all tv, ever, was just terrible crap. Not only were buyers dropping wads of cash on comics of dubious collectible value in the 1980s, but, also, there were major media companies speculating on small-press franchises by optioning characters and titles for possible professional development in the industrial-entertainment complex. If I recall correctly, the creators of otherwise unknown characters like MightGuy (Tim Corrigan), PieMan (Chuck Bunker), Ultra Klutz (Jeff Nicholson) and others, were offered large cash payments for the exclusive rights for their creations. Most accepted. None of these projects developed beyond the vaporware stage, except Steve Moncuse’s Fish Police (very briefly). This unexpected interest in small press comic books (featuring original characters and stories) was due, no doubt, to the nuclear-blast arrival of the Teenage Mutant Turtles. Eastman and Laird’s TMNT originated in small press, and rapidly grew into a multi-media animation, merchandising, and advertising behemoth within a year (give or take) of their introduction to the mainstream. No doubt, corporate executives were wondering what other unclaimed riches lurked just beneath the surface of the greater cultural awareness, just waited to be seized and exploited. The gold rush was on, with companies competing with each other to outbid and outgrab every likely superhero, martial artist, or monster in the pages of hand-collated, folded, and stapled xerox fanzines. Although not directly involved, I am aware of this sudden convergence of macro and micro media as I was an editor and writer for the Comics F/X, a small press news and review tabloid published out of Seattle by the “Seattle Four” (mostly Edd Vick’s MU Press). I was also a self-publisher, but sadly, none of my properties were optioned. The movement by the media giants to acquire small press properties came and went so fast that I wasn’t even aware of it until it had almost blown over; otherwise I might have tried to find a buyer for my own projects. In retrospect, I think the corporate media giants had it right the first time; there’s gold in them thar hills… but only if they can maintain focus on the project after the original claim. Development is messy, and doesn’t always yield immediate results. I don’t have any inside information, but it would appear that the difficult launch and subsequent failure of the Fish Police animated series marked a turning point in the appeal of small press properties. This is regrettable, and probably inevitable, given that the creative team for the Fish Police cartoon show was never fully supported. In one of the commentaries for the animated series, The Simpsons, the show runners remarked that the writing talent for Fish Police consisted of a single person…!, In comparison, The Simpsons had a whole team of top-notch comedy writers, and even so, burnout and turnover were a constant problem. Fish Police never had a chance. Sadly, it was considered a test case for the marketability of other small-press options. One wonders what could have happened if many of the other creator-owned stories and characters from the world of the 1980s small press had been allowed to grow and develop in a well-funded, well-managed, and fully-supported environment. We might have been grabbing a bag of take-out burgers in a paper sack featuring Larry Blake’s android superheroine NightShade, or collecting the whole series of Doug Holverson’s Captain Saucer action figures and vehicles (mostly featuring giant catgirls and classic Studebakers), or sitting down to watch a surreal late-night episode of Steve Willis’s Morty the Dog. Although, Morty _might_ have had to be censored for the broadcast sensibilities of the 1980s. Pre-internet, y’know. I never heard of Pieman being optioned, so I’m not sure if it happened. OTOH, IIRC, Nicholson also had Father & Son optioned. Having Captain Saucer optioned would have been sweet, especially since that was bit of an extended down time in my life. Although, I’m now going through scans of those old issues and wish that I could fix a lot of herky-jerky writing and face and figure drawing. OTOH, it does have a grocery list of bragging rights including being a Johnny Bravo meets Futurama thing with Atompunk and Dieselpunk before all that stuff existed. Captain Saucer hassince been split into two projects: InterStellar OverDrive and the Captain Saucer reboot. The latest and greatest ISOD retcon is now centered on Revellia, Flexia’s teenage *daughter*. The CS reboot has a cast of mostly expies and has been tweaked to be more straight forward goofball humor. I wouldn’t be surprised if there was some unsung Captain Saucer influence in Johnny Bravo or Futurama. I wouldn’t be surprised if there wasn’t. I should get going again on The Inventer & Igor or Sci-Fi Guy! Until then check out my sketchbook on Lulu. Hee heee…. I was hoping you’d post at some point! >I was an editor and writer for the Comics F/X, a small press news and review tabloid published out of Seattle by the “Seattle Four” (mostly Edd Vick’s MU Press). I was also a self-publisher, but sadly, none of my properties were optioned. >This unexpected interest in small press comic books (featuring original characters and stories) was due, no doubt, to the nuclear-blast arrival of the Teenage Mutant Turtles. That, and the Keaton Batman film. NOBODY expected too much from the film, and when it hit a lot of companies freaked out, buying the rights to EVERYTHING…. just in case it was gonna be the next big thing. (That’s one reason why a lot of old cartoons disappeared from syndication in the 90’s; companies were sitting on the rights.) TMNT came out of nowhere, and exacerbated the whole process. >the creators of otherwise unknown characters like MightGuy (Tim Corrigan), PieMan (Chuck Bunker), UltraMan (Jeff Nicholson) and others, were offered large cash payments for the exclusive rights for their creations. Most accepted. None of these projects developed beyond the vaporware stage, except Steve Moncuse’s Fish Police (very briefly). >I think the corporate media giants had it right the first time; there’s gold in them thar hills. It would seem that their sudden decision to drop all development on small-press properties was based on the failure of the Fish Police animated series, however, apparently the creative team for this show was never fully supported. That happens a lot. Especially for animation, franchises are seen as a tarp to slap over the same old same old. The creators are seldom involved. Look at how different the TMNT show was from the comic. I don’t usually do inline replies, but this is an effective way to respond to several different topics in one post. Hard to believe, but SnowBuni was first published in minicomics over 30 years ago. My twenty-year-old self would never have believed that I would work on a project this long. And yes, I am feeling old, very old, but fortunately, SnowBuni is as young and perky as ever. I envy her. >That, and the Keaton Batman film. NOBODY expected too much from the film, and when it hit a lot of companies freaked out, buying the rights to EVERYTHING…. just in case it was gonna be the next big thing. Yes, but Batman was a mainstream property. TMNT was first published virtually underground, and it’s success exposed all the publications that were “flying under the radar,” usually with a circulation of less than 100. But suddenly, minicomics were HOT. And then, they were not. >That happens a lot. Especially for animation, franchises are seen as a tarp to slap over the same old same old. The creators are seldom involved. Look at how different the TMNT show was from the comic. Yes, I see it as a sort of strip-mining a property. Take the unique characters and situations, strip away all the elements which are not “mainstream,” and then apply the same standard storytelling devices and situations. Gather a few quick bucks, and then abandon the property, never to be seen again. I think this is one of the reasons that YouTube publishing has gone ballistic in the last couple of years; content is absolutely creator-controlled, and talent wins invaluable subscribers. This is the wave of the future. Even _I_ have considered posting my own low-budget cartoon series. >but Batman was a mainstream property. TMNT was first published virtually underground, and it’s success exposed all the publications that were “flying under the radar,” usually with a circulation of less than 100. >But suddenly, minicomics were HOT. And then, they were not. ….as the execs tried grabbing up every damned thing, not knowing what would hit. > I see it as a sort of strip-mining a property. Take the unique characters and situations, strip away all the elements which are not “mainstream,” and then apply the same standard storytelling devices and situations. Gather a few quick bucks, and then abandon the property, never to be seen again. That’s pretty typical. You see that when a lot of properties make the jump from one medium to another. >I think this is one of the reasons that YouTube publishing has gone ballistic in the last couple of years; content is absolutely creator-controlled, and talent wins invaluable subscribers. ….although I think there’s still some randomness there…. I’m looking at you, Fred…. and there’s the mitigating factor that it’s free. Folks will try something a little different if there’s little risk or investment for them. I think that’s why internet popularity doesn’t always translate to a career.